It’s no secret that Gerry Nelson posts some of the better-liked outfits on Styleforum. He dresses in a very approachable mix of tailored and casual clothing, and has a great eye for colors. In particular, he often pairs an indigo, work-style jacket with either jeans or trousers, which, though simple, is a fantastically good look if you get the fit and shade of your clothing right. With that in mind, here’s an example of an outfit that at touches on some of Gerry’s sensibilities. First, our outerwear is casual but neither sloppy nor boring. A deep indigo, such as you’ll find on this Blue Blue Japan gown coat, goes with just about anything, including the Eidos pullover we’ve chosen. A Drake’s shirt with a button-down collar is a good casual accompaniment, and will look just as good on its own with the medium-wash Orslow jeans. Finally, a pair of tassel loafers in a rich brown suede means you can easily wear this outfit into springtime, and the addition of a giant robot on your pocket square is the kind of detail that keeps your wardrobe from boring you to tears. Now, I’ve never had the opportunity to smell Gerry Nelson in person, but I am a fan of Tom Ford’s Plum Japonais, which is a pleasantly soft and alluring blend of plum, oud, and incense. It seems a perfect fit for the deep colors shown above, and is sensual without being overbearing. Altogether, this outfit is the very definition of comfortable, just likemost of Gerry’s looks. It’s the kind of combination of sharp and relaxed that’s perfect for most of today’s offices, as well as for most of the weekend. Gerry may have perfected his own particular style, but that doesn’t mean you can’t experiment with similar ideas, and embrace a palette of deep, rich colors this spring. It can be tough to know what to wear when it’s sunny and cold. Too many layers, and you’ll end up sweaty and then freezing. Too few, and you might as well spend the whole day inside. Since sunny winter days are best spent in the great outdoors (or at least out of the house), let’s go over an outfit that will keep you happy no matter what you’re up to. First, you don’t want anything to be too tight. That kills your insulation, and you end up, well, sweaty and freezing. In this case, that slouchy streetwear look has a temperature-regulating benefit. So the outerwear – this beautiful cracked pepper slouch coat from De Bonne Facture – isn’t too heavy, which means that even if you pop into a coffee shop you don’t instantly overheat. 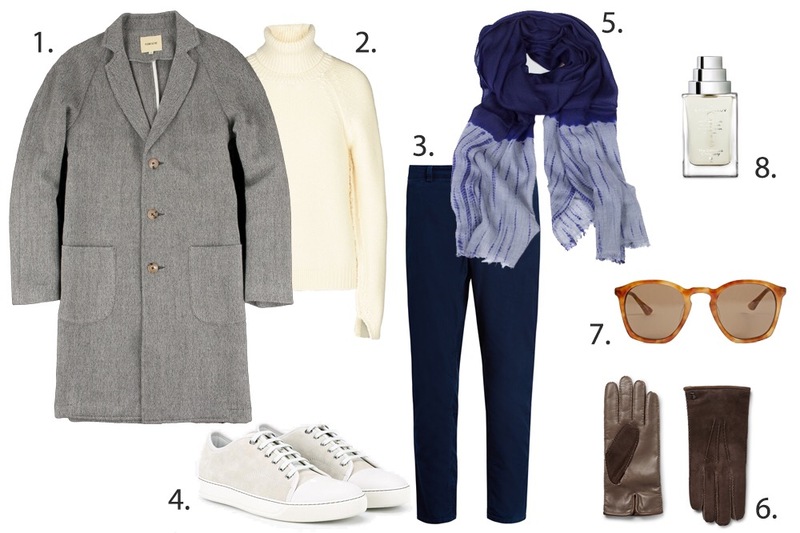 Most of the warmth comes from a hefty rollneck, and cream is a great choice for wintry days when the sun’s out. Since we’re going for a look that’s light but still tailored, we’ve opted for slim trousers from Styleforum favorite Blue Blue Japan as opposed to denim. The rich indigo hues are more compelling than a faded blue when worn with sharper clothing, and let’s face it – they’ll be more comfortable than your heavy jeans. On the feet, a leather sneaker with a robust sole will keep your feet happy while you’re moving around, and the details on this pair from Lanvin will keep you from looking like a slob when you’re too lazy to wear lace-up boots. Finally, don’t forget the details. We’re big fans of oversized scarves that can be wrapped around the neck or draped over the shoulders, like this beauty from Suzusan. Cashmere-lined gloves offer a good compromise between weight and warmth, and are perfectly suited for days when you don’t have to do any shoveling. Finally, the winter is no time to ignore protective eyewear, and Dries van Noten’s ongoing collaborations with Linda Farrow are stylish and versatile. To top it all off, try a winter scent that’s as bright and chilly as the weather. De Bachmakov, from The Different Company, smells of snowmelt, icy streams, and frozen sunlight; cedar, coriander, and white freesia combine to form a foundation that’s rich, compelling, and perfect for a sunny winter’s day. You’ll look great, you’ll smell great, and you’ll be ready to spend the day enjoying all the sunlight you can. Wow, sales season really came in like Miley Cyrus this year. At this point in my life, I have a pretty short list of clothing I want, and a lot of it doesn’t go on sale that often. That said, this Black Friday has kind of thrown me for a loop, and I’ve managed to grab some pieces I wasn’t expecting to see (I’m not complaining. Your tastes may certainly differ, but here are a few pieces I think are worth capitalizing on this year. Don’t forget to look at our list of all the Black Friday Sales worth your time to see sales codes for the below webshops. Kapital Century Denim at Blue Button Shop Blue Button came in YUGE this year. I almost feel bad. They’ve got 30% off of all stock with code THANK30, which means you can pick up a pair of Kapital’s incredible Century Denim for 265 USD shipped, which is about the same as it would cost you to proxy the same pair from Kapital in Japan. If you’ve ever wanted a pair, I’m not sure I can remember seeing a better deal. Did I mention that Blue Button came up big time? When’s the last time you saw Viberg Boots for 30% off? That puts several models just under 500$ shipped with code THANK30, which is nuts, even if the models on offer are pretty basic. Jump on this, people. Comme des Garçons Parfum at Notre Shop Again, 30% off what is (in my opinion) a great fragrance that doesn’t often see discounts. CDG’s incense series is a fantastic blend of natural and synthetic aromas; meant to invoke human spirituality in a way that is both immediately recognizable and undeniably otherworldly. My favorite is Ouarzazate, but Kyoto is great as well – heck, at 67$ a bottle after the coupon code, you might as well buy all four. How could I make a list of any kind without at least one indigo-dyed item? This shop coat from Blue Blue Japan was a stand out piece from this fall’s collection, and the sashiko fabric with natural indigo dye makes for an incredible color and texture. Did I mention that No Man has it for 371$, which is a must-buy price? No Man’s entire sales list is slightly bonkers, but these pieces are beautiful and unique, which will go a long way this winter – and well into springtime. Marimekko “Nimikko Mikko” bathrobe Hailing from the land of the Moomins, Marimekko has long offered pop-inspired prints to households that skew towards the nouveau Scandinavian. I have a soft spot for the loud stuff, but these simpler bathrobes are equally fun. Do as Marimekko suggests and wear yours after a long, relaxing sauna. Although the linen industry had its origins in Northern Africa and the Fertile Crescent, the fabric and the plant eventually made their way north. Today, most commercial linen is produced across Europe, and Ireland has been the metaphorical and physical capital of linen production for several centuries. Debate continues as to who introduced flax to Ireland – likely Phoenician traders – but the plant took to the climate and linen production became commonplace during the Middle Ages. Flax thrived in the Irish climate in particular, and the Emerald Isle has long been a source of quality linen, as well as wools. However, Irish wool manufacture was subject to a series of oppressive laws throughout the 17th century, aimed at preventing Ireland’s wool exports from competing with the wool coming from England, and it suffered further due to the advancement of the linen industry. Throughout Victorian times, Belfast was the capital of European linen production, and contemporary Irish Linen is the best-known linen brand in the fashion industry. However, the flax used in Irish Linen is no longer (mostly) grown in Ireland, but is imported from elsewhere in the world for spinning and weaving – primarily from France, Belgium, and the Netherlands. The branding of “Irish Linen” refers solely to the production of flax into fiber. Linen is a characterful fabric. Flax fibers are stiffer and scratchier than cottons, and woven linen is also more prone to wrinkling. Any consumer should certainly take the feel of linen fabrics into consideration before a purchase, because while the fibers do often grow softer with wear and washing, linen shirts will largely retain an airy crispness that some people find scratchy and uncomfortable. However, this same crispness helps with air circulation and warm-weather comfort, and it means a linen shirt is less likely to stick to you when the temperature rises. That said, heavy linen and linen blends are very much an option for fall and spring. Although autumn nights are cool, the direct sun means that wearing thick wools or flannels is often a poor idea. Heavy woven linen offers weight and warmth, as well as breathability. These fabrics tend to be harder to find, but if you can get your hands on them they’ll provide a welcome change from your usual digs. In particular, a knit linen sweater or jacket can offer perfect transition-weather comfort. These tend to be knit more loosely than your standard cotton or wool knit, which I find very pleasant when the weather is capricious. A loose knit can go under an outer layer without causing you to overheat, and it can be worn alone over a shirt just as easily. Finally, linen offers a wonderful counterpoint to the Super wools and fine cottons that still dominate the contemporary RTW tailoring market, particularly in America. Although the most common linen product (outside “linens,” or bedsheets and the like) remains the linen shirt, linen suits and separates have become an increasingly prevalent warm-weather choice thanks to growing awareness and interest in men’s tailoring, as well as the success of online made-to-order suits and accessible suiting brands such as SuitSupply that offer rotating, seasonal options. Linen fabrics, especially wovens, do have a tendency to wrinkle. They are often seen as more casual fabrics than wool, particularly when not blended with wool or silk. The yarns tend to be slubbier and less matte than cotton or wool yarns, but even so, fine linen shirts are anything but slobbish. And while linen suits are inevitably wrinkly the effect is one of casual elegance rather than disregard, and have been the choice of well-dressed men the world over.